The smooth pink scallop has a circular shell and grows to 6 cm across. It has more than 30 prominent radial ribs interspersed with smaller riblets. 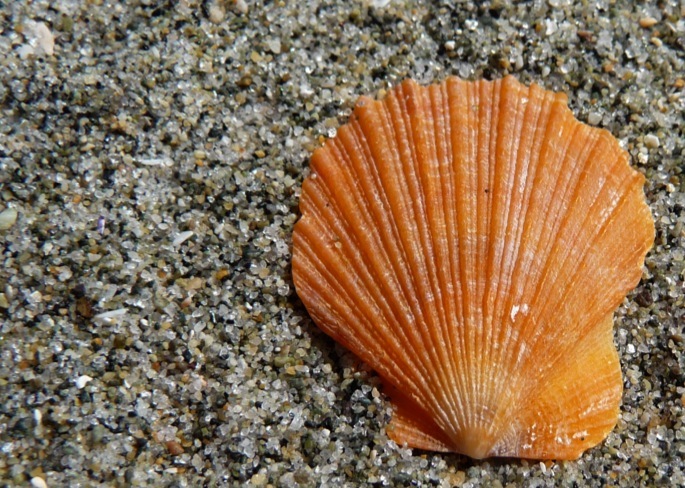 The shell can be pink, reddish-purple, white, or yellow. One shell valve is paler than the other (the lower/right valve; click here for shell orientation information). This scallop inhabits areas with gravel-mud bottoms, from the low intertidal (occasionally) or subtidal to a depth of 200 m. It may also be found less commonly in rocky areas. Its range extends from northern Alaska to southern California, as well as from Siberia to northern Japan. It is less common south of Puget Sound. It can be difficult to differentiate between smooth and spiny pink scallops as the shells of both are often encrusted with sponges. The spiny pink scallop (Chlamys hastata) has fine spines on the edge of its shell valves, and has less than 30 broad, deep radiating ribs. The smooth also tends to have a more rounded shell than the spiny. The smooth pink scallop is harvested commercially by divers and dredging, though it isn't as common as the spiny pink scallop. See the Ocean Wise and Seafood Watch scallop pages as well as the Seafood Watch report on pink and spiny scallops for information on fishery sustainability. The hinges on scallops are called “ears” due to their large size. Like other scallop species, the smooth pink scallop can swim away when startled by clapping its shell valves together. Cowles, D. (2005). Chlamys (Chlamys) rubida (Hinds, 1845). Invertebrates of the Salish Sea. Rosario Beach Marine Laboratory. Accessed 05/09/2014. Harbo, R. M. (2011). Whelks to whales: Coastal marine life of the Pacific Northwest. 2nd ed. Madeira Park, BC: Harbour Publishing. P. 124.